If you didn’t know this month is Women’s History Month, now you know! It is a time to remember and celebrate the achievements of women throughout the history of this great nation. 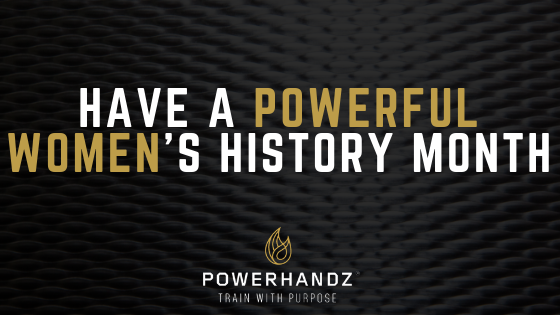 Our family at POWERHANDZ is incredibly grateful to have so many remarkable women in our lives and knows that the future will be so incredibly bright; but a bright future begins now. There is no time like the present and today is a gift to all women for empowerment and success. Oprah once said “Think like a queen. A queen is not afraid to fail. Failure is another stepping stone to greatness.” Being an empowered female isn’t always easy but it is one of the most gratifying paths in life. We want to give a massive shout out to all the amazing women who follow their dreams and let nothing stop them. Women’s History Month isn’t about one specific group, country, or type of women, it’s about all women, most importantly for empowering women. We want all women to show the world how strong, determined, unstoppable, and ready to reach the top they are. The future is what we make of it and who knows what that will look like with more strong women. The time is now to seize opportunities and create the future you want. This is #OURTIME! Never forget, you can do whatever you want and never be afraid to pursue your dreams. The POWERHANDZ family is rooting for you every step of the way. As Rihanna said “There’s something so special about a woman who dominates in a man’s world. It takes a certain grace, strength, intelligence, fearlessness, and the nerve to never take no for an answer.” Get out there and make history.